Burnley boss Sean Dyche was pleased to see his players hit another historical marker for the club after going seven games unbeaten in the Premier League. The Clarets have accumulated 15 points from the 21 available to them since Boxing Day, their best stretch without defeat in the top flight since the 1974/75 campaign when under the guidance of Jimmy Adamson. Dyche, who was nominated for January’s Manager of the Month award, which was won by Manchester United boss Ole Gunnar Solskjaer, also stressed the importance of picking up three points going in to the break following three successive draws. “It’s a strange thing because we had them three wins and then three draws and a bit in there that went against us,” he said. “That can change if you don’t win this one. They go ‘oh you’re not winning now’ and that reverses because now we’ve won on the back of those three draws, which look like fantastic draws. “I’m pleased with the overview of that and with seven unbeaten in the Premier League, it’s another historical marker for these players. “It’s important because it means you’ve been doing well. I’m mostly pleased with the mentality of the group, there’s been heavy questions of them this year, lots of questions, confusion, odd things and new challenges. “Historical markers are a nice little side thing for the players. They deserve it, they’ve worked hard in them seven. It could’ve been more, I get greedy. The Clarets have flown out to Portugal for a warm-weather training camp on the Algarve fresh from escaping the bottom three once again. Dyche admired the strength of his squad to see through results that had impacted on their positioning earlier in the day. Cardiff City’s late show against Southampton at St Mary’s had pulled Burnley in to the relegation spots beforehand. However, while the complexion changed, the group’s focus didn’t. 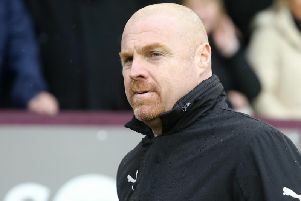 “Yes again, I’ve been proud of the lads for not getting in that, we’re just focussing on what we’re doing,” said Dyche. “You can see that they were focusing on their performances. “They’ll know how the results went, but there’s a true focus on the performance. They deserve a lot of credit for that because it’s not easy. “Social media gets bombarded with what’s going on. Being able to look through it and think ‘we’re working, this is what we’re doing.’ I’ve been pleased with the players.